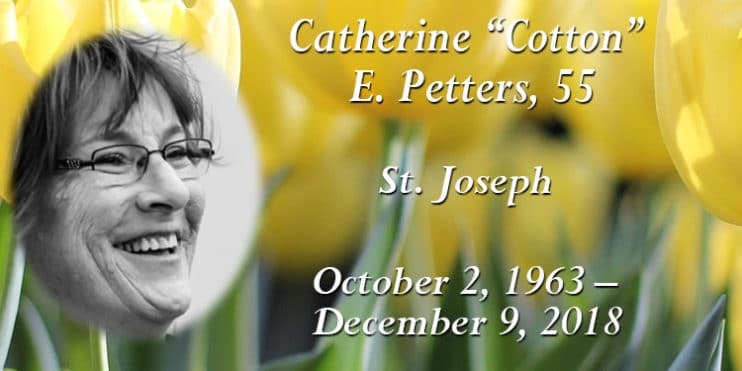 Catherine “Cotton” E. Petters, 55, of St. Joseph, died peacefully in her sleep on Dec. 9. A Celebration of Life will be held from 2-6 p.m. Saturday, Dec. 15, with a time of sharing at 3 p.m. at the Williams Dingmann Family Funeral Home, St. Cloud. Anyone who knows Cotton or her family is welcome. Petters was born on Oct. 2, 1963, in St. Cloud to Fred and Rosemary (Boyle) Petters. Cotton enjoyed gardening and planting beautiful flowers in the Spring. She brightened the lives of so many through her kind nature and desire to help people as an advocate for women at Anna Marie’s Alliance. Cotton was a peacemaker and was always concerned about people and was the matriarch of her family. She sought to bring peace to women and their families, the same way she cultivated and maintained a loving, warm, safe place for her own family. Survivors include her husband, Mike Nordmann and children, Alex Swingley (Dave Rausch) and Robin Swingley (Shelby Weisen); siblings Fred (Kim) Petters, Becky (Steve) Randa, Jon (Colleen) Petters, and Tom and Chris Petters; and brother-in law Joe Hoover. She was preceded in death by her parents and sister Mary Hoover. In lieu of flowers, please consider making a donation to Anna Marie’s Alliance (P.O. Box 367, St. Cloud, Minn. 56302) in memory of Cotton.